To say that the Commodore 64 was an important milestone in the history of personal computing is probably a bit of an understatement. For a decent chunk of the 1980s, it was the home computer, with some estimates putting the total number of them sold as high as 17 million. For hackers of a certain age, there’s a fairly good chance that the C64 holds a special spot in their childhood; perhaps even setting them on a trajectory they followed for the rest of their lives. At the risk of showing his age, [Clicky Steve] writes in to tell us about the important role the C64 played in his childhood. He received it as a gift on his fifth birthday from his parents, and fondly remembers the hours he and his grandfather spent with a mail order book learning how to program it. He credits these memories with getting him interested in technology and electronic music. 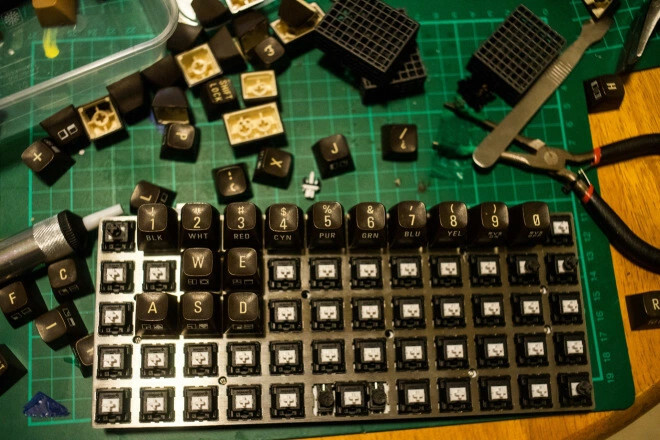 In an effort to keep himself connected to those early memories, he decided to build a modern keyboard with C64 keycaps. As you might expect, the process started with [Steve] harvesting the caps from a real Commodore, in fact, the very same computer he received as a child. While the purists might shed a tear that the original machine was sacrificed to build this new keyboard, he does note that his C64 had seen better days. Of course, you can’t just pull the caps off of C64 and stick them on a modern keyboard. [Steve] found the STLs for a 3D printable C64 to Cherry MX adapter on GitHub, and had 80 of them professionally printed as he doesn’t have access to an SLS printer. He reports the design works well, but that non-destructively removing the adapters from the caps once they are pressed into place probably isn’t going to happen; something to keep in mind for others who might be considering sacrificing their personal C64 for the project. [Steve] installed the caps on a Preonic mechanical keyboard, which worked out fairly well, though he had to get creative with the layout as the C64 caps didn’t really lend themselves to the keyboard’s ortholinear layout. He does mention that switches a bit heavier than the Cherry MX Whites he selected would probably be ideal, but overall he’s extremely happy with his functional tribute to his grandfather. If you’re more of a purist, you can always adapt the C64 keyboard directly to USB. Or go in the complete opposite direction and put a Raspberry Pi into a C64 carcass. > As you might expect, the process started with [Steve] harvesting the caps from a real Commodore, in fact, the very same computer he received as a child. While the purists might shed a tear that the original machine was sacrificed to build this new keyboard, he does note that his C64 had seen better days. It deserves a proper shrine in the corner of your home for daily devotion. My idea, for a ZX Spectrum if I ever did it, would be for an interface that goes onto it’s expansion bus. It would have a ROM that overrides the system ROM (easy, the ROM /CS line is on the connector) and scans the keyboard, sending keypresses to some sort of chip I’d put there, probably a Teensy or something that can pretend to be a USB keyboard. You could do the same thing in a C64 cartridge. Then the whole computer would be the keyboard, the way the gods of old demanded. You might need to produce 9V from the USB to power it, and the Speccy used just under an amp, so that’s a bit to ask from a USB port. USB-C would be easier, or just use the Speccy’s old mains adaptor. Again, same thing applies for any other 8-bit. What would be nice, is that you wouldn’t need to modify the computer at all. In fact you could go further, put a bit of a tweak in, add a serial port profile to the USB, and allow fast uploading of software straight into the Spectrum from the PC over USB. Fitting 102 key functions onto 40 keys would be a little bit of a challenge, but the Spectrum’s own ROM had over 150, something like 200, squeezed on there. Through a multitude of different keyboard modes and shifts. Not because tearing up a C64 is sacrilegious, but because the C64 keyboard sucked. The layout sucked, the keys sucked. Sure, it beat out the rubber-keyed ZX Spectrum and the membrane-keyed ZX81, but it cannot hold a candle to even the most generic keyboards of today. I’ve got to hand it to him though, somehow he managed to make the layout *worse*. Steve here. You’re right that the original keyboard was eh… not great. That’s mostly down to the switches though. The keycaps are actually really quite nice. They feel pretty good on the Cherry MX milky/whites I’ve got on the board, though I know those don’t stay quite true to the linear feel of the original. In terms of layout, I wouldn’t go by the symbols on the caps too much. I had to make some err, creative decisions because of their sculpted nature and the Preonic’s grid. The Return key is really the spacebar; the keys act as modifiers for different layers, the RUN/STOP key is actually a Hyper key… etc. It’s not perfect, but it works pretty well for what I want! Now that makes more sense! The grid layout on the Preonic board is known as ‘ortholinear’, and is a deliberate design choice. The theory is that it is better than a standard staggered setup as your fingers don’t have to move in an unnatural diagonal fashion to reach different keys. Whether that’s accurate or not I have no idea, but I do know that it feels a lot more comfortable to type on than my other staggered boards. It did take a few days to get used to, but I prefer it now. It was 1994, and my kids’ school had a bunch of Commodore 64s. But I noticed 5-10 of them were stacked in boxes in the back of the room. Those were the broken ones. Being an electrical engineer, I figured I would have a look at them. Perhaps a bad power supply or loose wire that would be easy to fix. Nope. Pretty much every one of them had keyboard issues. Either the ENTER key or the space bar was bad. I took them apart, swabbed the contacts with alcohol, and they were good to go. The women in the PTO thereafter referred to me as the electronics genius that fixes computers. Interesting I wonder if there’s any truth to that theory. I hold my hands in an “A” shape when I touch type, both index fingers pointed towards the middle of the bottom of the screen. So when I type, my fingres do move in orthagonal diretions as they follow the diagonal offset of the keyboard. Just experimentlly holding both hands pointing directly foward at the montor is quite painful for everything from my wrists to my back. So using the “ortholinear” keyboard would force my fingers into unnatural diagonals. But I guess that could be decades of muscle memory forcing my hands into their ‘A’ shape.